The need for marine shipping to reduce its emissions has prompted a growing number of vessels to swap traditional bunkers for batteries, but so far those making the move are typically smaller, short-sea vessels on fixed routes, such as passenger ferries. The energy and operational requirements of the world's mega-ships means if they are ever to realize 100% battery-power, it will be many years before that happens. It is here that MAN Energy Solutions believes synthetic bunker fuels can help, and points to its Power-to-X technology that can be used to convert renewable energy into synthetic fuels such as natural gas. 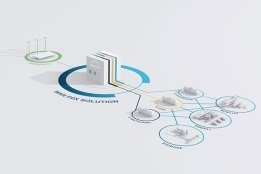 "With the help of Power-to-X, climate-neutral synthetic gas can be produced which reduces the carbon footprint in a wide range of applications without the need for major infrastructural investment," said Marc Grünewald, Head of Business Development, Power and New Energies at MAN Energy Solutions. "For example, CO2 emissions can also be reduced in all areas where the use of batteries is not possible. This applies, for example, to international shipping where complete electrification is not technically feasible, especially in the case of container ships." The firm is set to showcase its Power-to-X technology next month at the Energy Storage Europe trade fair in Duesseldorf, Germany.